Keith Terrell of DeKalb, 26, is walked into the DeKalb County Courthouse on Wednesday, October 05, 2016 in Sycamore. Terrell is charged with the first degree murder of his 7-week-old daughter, Kelis Terrell, after reporting to police that he squeezed her tightly around her chest and shook her when she would not stop crying at about 3 a.m. in August, 2013. 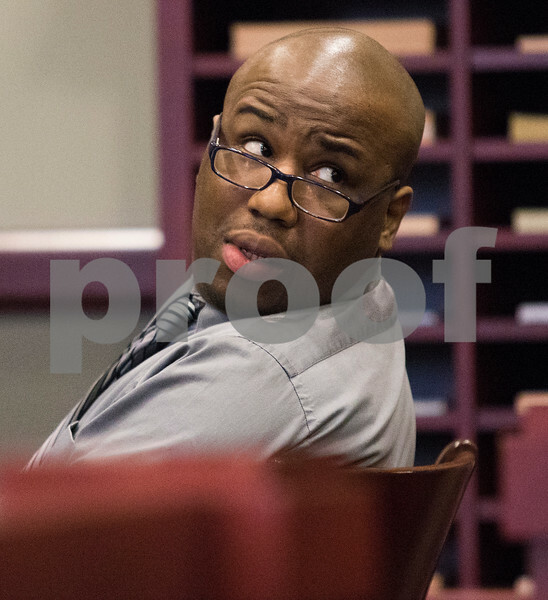 Keith Terrell of DeKalb, 26, looks back toward the door to the courtroom on Wednesday, October 05, 2016 at the DeKalb County Courthouse in Sycamore. Terrell is charged with the first degree murder of his 7-week-old daughter, Kelis Terrell, after reporting to police that he squeezed her tightly around her chest and shook her when she would not stop crying at about 3 a.m. in August, 2013.